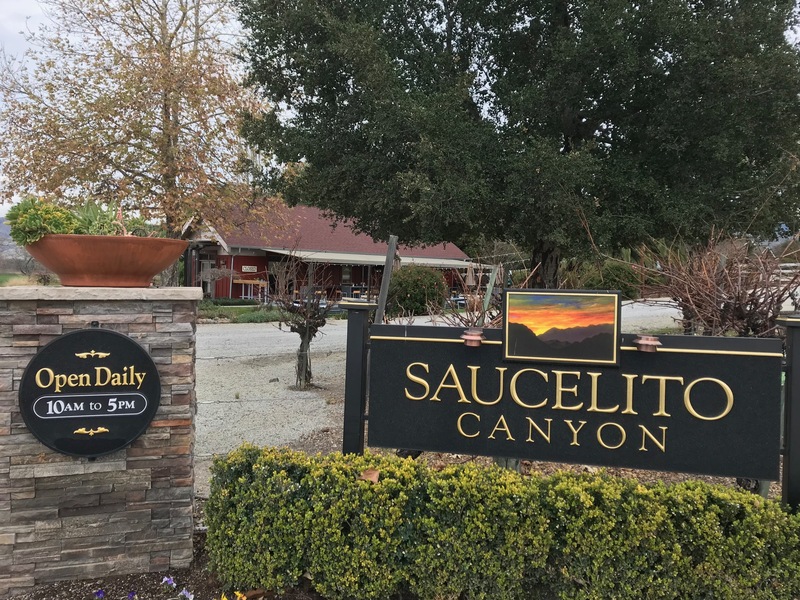 The Flavor Team visited Saucelito Canyon Vineyard in the Edna Valley AVA a couple times over the past few months, and we have a lot to share. 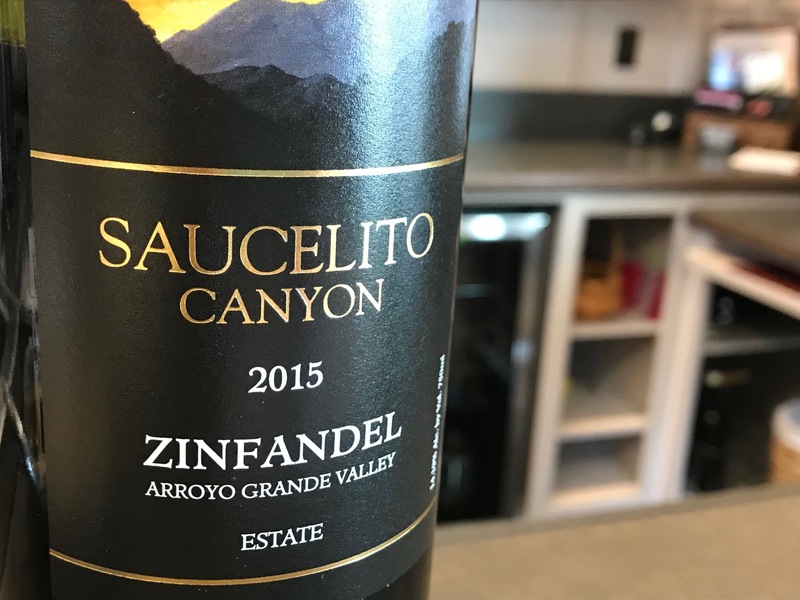 Saucelito Canyon Vineyard in Edna Valley features Zinfandel and other great wines. The bonus for you? More wines to explore from the wine-tasting lists for 2017 and 2018, and a sneak peak of their newest vintages—the 2015 wines were just released a couple weeks ago. Saucelito Canyon Vineyard is known for its great Zinfandel wines, but did you know they have the oldest vineyard in San Luis Obispo County? Yes, indeed. The original estate was planted in 1880 with vines from Croatia. In 1974, the Greenough family bought the vineyard, and bottled their first Estate Zin in 1982. Since then, the winemaking reins were handed from father Bill Greenough to son Tom Greenough in 2009, who continues the great heritage of winemaking at Saucelito Canyon. Saucelito Canyon’s original vines were planted in 1880–the oldest in San Luis Obispo County. Red: primarily Zinfandel, with additional varietals Tempranillo, Grenache, Petite Syrah. (ab) The wines that really struck a note for me were the 2015 Grenache Blanc, 2013 1880 Old Vines Zinfandel, and the 2014 Tempranillo. (ks) I was especially drawn to the 2016 Cote de Blanc, 2015 Zinfandel Estate, 2015 Zinfandel Peterson Ranch, and the 2015 Late Harvest Zinfandel. Gladys, looking festive in her Valentine’s Day finery. (ab) I generally prefer red wines, but the 2015 Grenache Blanc was exceptional. Fruity and light. I tasted light pineapple and peach notes. (ab) You can taste the history and heritage of the 1880 vines. Along with wonderful deep cherry notes, it had a light pepper spice. Bold and slightly fruity. (ab) This Tempranillo had a beautiful dark purple color, with notes of black cherry and a slight oak finish. This may have been my favorite of the entire tasting list. (ks) This is a 55% Roussanne, 45% Grenache Blanc blend, with a pretty pale yellow color. Nice lemon zest and apricot, with light minerality and good acidity. A really nice white wine with depth. (ks) It was fun to compare Saucelito Canyon’s winemaking as shown through the Zinfandel grapes from two different AVAs. This Zinfandel, with grapes from their Arroyo Grande Valley vineyard, was deep ruby red and JUICY (yes, capital letters). Like biting into a berry that pops open with juice. Raspberry and cherry notes, but not overly sweet, and a bit of minerality. Saucelito Canyon’s estate vineyard was originally planted with grapes brought from Croatia. (ks) Then, I compared the Zinfandel made from grapes from the Peterson Family Ranch in Lodi. Very different expression. Dark red hue, deep red stewed fruit, and jammy but not overripe and heavy. The tannins? Soft, and an almost creamy finish. (ks) Since this was open, I tried it (and took home a bottle). From my perspective, some late-harvest dessert wines can be so sweet and cloying. This was not that. Stewed plums with the bright characteristic of Zinfandel still present. After whole-cluster fermentation for five months, it was bottled unfiltered and unfined. 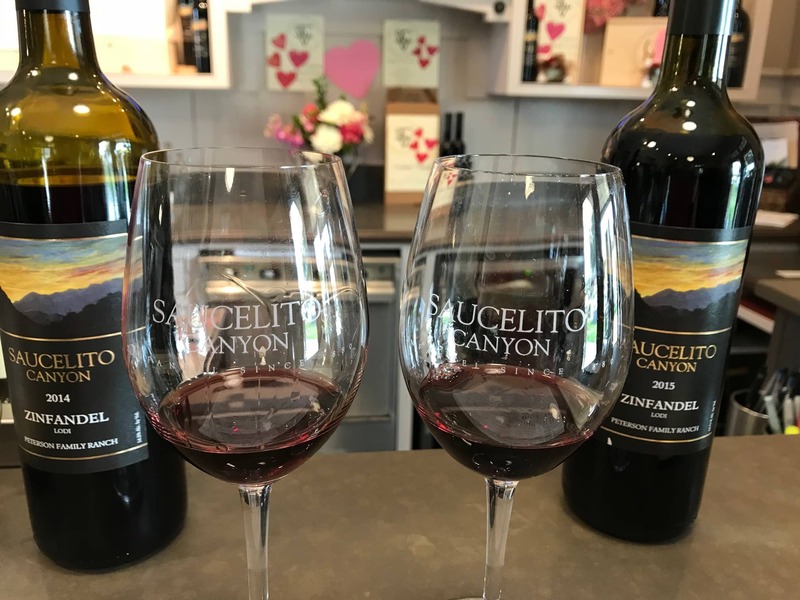 Saucelito Canyon’s tasting fee is just $15, which is waived with the purchase of one bottle of wine. For a go-to, always good, goes with everything wine, we recommend taking home a bottle (or three) of the Backroads Zinfandel. For a few dollars more than the tasting fee, you get to enjoy Saucelito Canyon again at home. Take your time and enjoy a glass of wine or a tasting in the peaceful tasting area off the main entrance (don’t worry, Gladys will come outside and visit to be sure you’re enjoying the experience). Thanks to our tasting host Correne, who has been with the winery for 10 years. Your generosity with sharing history and information is so appreciated. And thank you, Gladys, for your kind and genuine welcome to everyone who walks in the door. 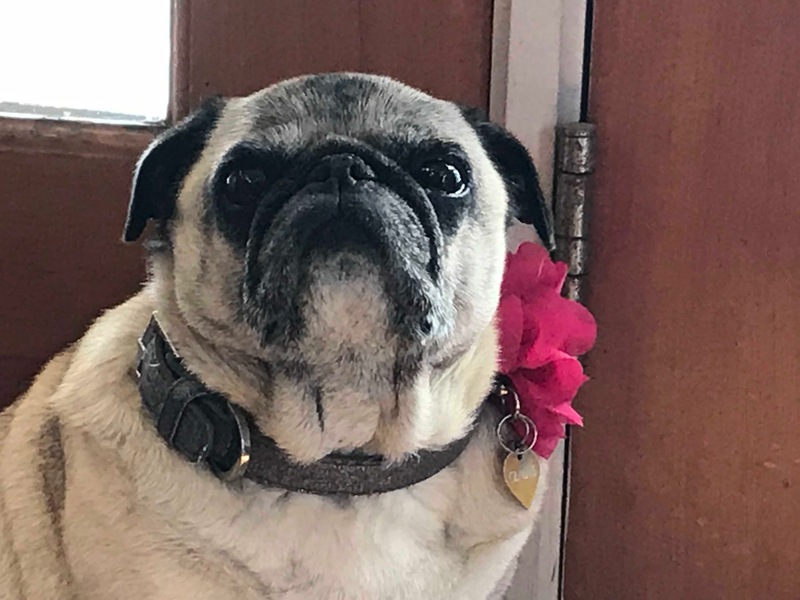 You are the best winery Pug on the planet. Saucelito Canyon is located between San Luis Obispo and Arroyo Grande, just off Highway 227 (Edna Road) on Biddle Ranch Road, near the intersection with Orcutt. 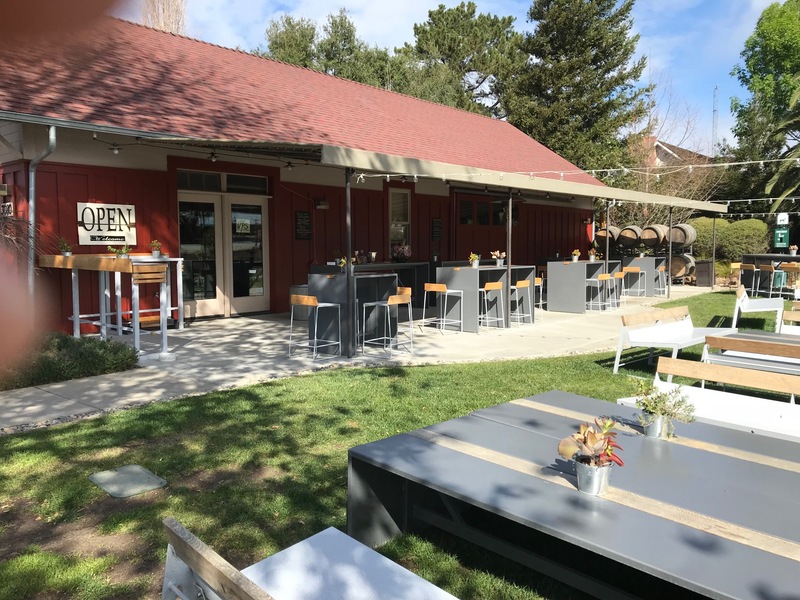 It’s open every day 10:00 to 5:00, and the friendly people and peaceful seating area outside make for a great wine-tasting experience. And, if you enjoyed this article, please do share with your friends and leave a comment and join the Great Flavors community on Facebook.